Ready for another tip in the "Jump-Starting Your Blog" series? For this one, we're going to visit your blog as if we were a first-time visitor. You'll find that this is an exercise I will recommend many times because I think it is a good way to evaluate blogs. This time around, we have a fairly specific question in mind as we view your blog through the eyes of a first time visitor. We want to know how easy it is to determine which of the many available social networks you use (e.g., Facebook, Twitter, Pinterest). Why is this important? First, you want to make it as easy as possible for those who visit your blog to connect with you on the social media platforms you are using. When visitors are connected to you, they are far more likely to share, promote, and interact with your content. If you use Twitter, you want visitors to follow you and interact with you on Twitter. If you are on Facebook, you want visitors to find you there. Believe it or not, many visitors will prefer to interact with your content on social media instead of leaving comments on your blog. Your goal should be to make it as easy as possible for them to do so. There is at least one other reason why it is a good idea to make your use of social media platforms apparent, and it is probably even more important for the goal of encouraging others to interact with your content. You want your readers to know which social media platforms you use since this may influence where they decide to share your content. Suppose you are very active on Facebook but do not use Twitter at all. If I can easily tell this from your blog, I may be more likely to share your content on Facebook than on Twitter. After all, if I share your posts on Twitter, you'll never know I am doing so. Assuming it matters to me that you know I am sharing your content (and this does often matter), it is helpful for me to know where you are active. Go to the home page of your blog. Imagine that you are a first-time visitor who has landed on your home page. How easy is it going to be for you to determine which social media platforms this blogger is actively using? If you use Facebook, is this evident from your home page? How about Twitter? 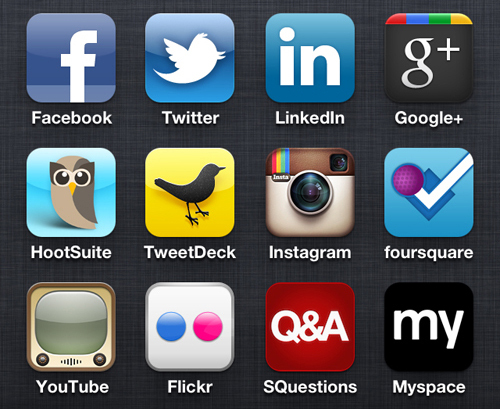 If you are using these or any other social media platforms, you need to make this clear on your home page. You do not have to add social media buttons to your home page like I have, but I would recommend that you do something to clearly indicate to visitors of your blog which social media network(s) you use the most and make it easy for them to connect with you there. If you do not want to include every social media platform you use, that's fine. Include the one or two you use most often. Let visitors know how and where they can follow you, and give them an idea of where you will be most likely to see them sharing your content. I imagine that this tip strikes many of you as an obvious one. You might be surprised by the number of atheist/skeptic/freethought/secular blogs I visit for the first time that offer no information on the home page about which, if any, social media platforms the blogger uses. There have been a number of times recently where I've wanted to follow a blogger on Twitter or Facebook but have not been able to find any mention of how to do so even after digging through the blog a bit. Most first-time visitors are not going to have the patience to dig around, so these are lost opportunities.